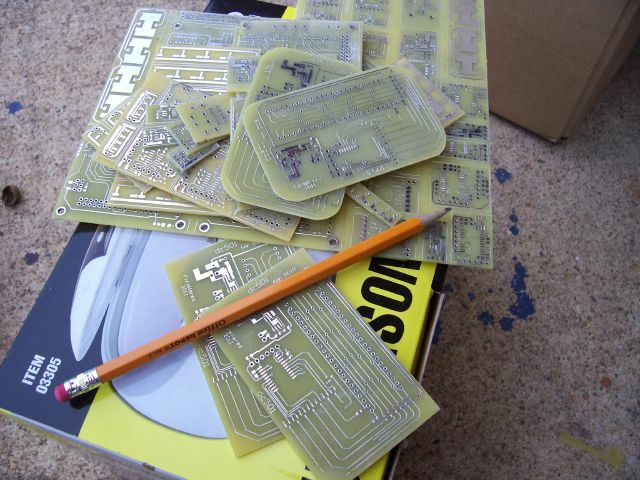 I designed and built some badges for Defcon 19 for our DC group, dc501. The badge is based on a Microchip PIC18F13K50. Power is from a single CR123, boosted to 5V by an LT1610. The blue 7-segment LEDS are some Chinese e-bay purchase; they were cheap and look nifty. Board was designed to fit in an Altoids tin; called cool and retro by folks who gave us positive feedback at the con. You can see the paper doll for the board in the Altoids can. As part of documenting my projects here on this blog for the hacker/maker crowd, I will include some tips that will be old hat for experienced hardware folks. Printing a 1 to 1 paper doll is always a good idea, because parts don’t always fit the way they look in layout. 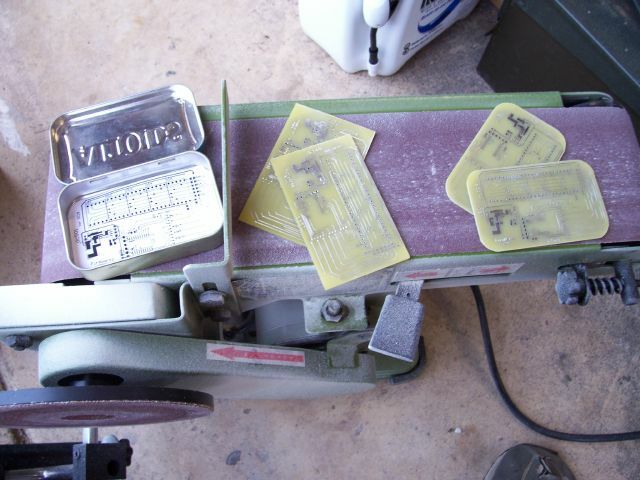 In this case it also let me come up with a template for shaping the boards to fit the rounded edges of the tin. At the time of this writing, both mine and ShortGrrl’s are still running on the original CR123 installed at Defcon 19…not bad! We ran our badges pretty much anytime we were awake at the con, and have run them at a number of dc501 meetings. The CR123 is still my favorite battery, but that comes from designing military stuff I guess. There’s a lot of energy in a CR123, and an efficient step-up regulator can help in squeezing it all out. Schematic and layout done in Altium/Protel DXP. The boards were part of a prototype lot purchased from low-cost no-frills online board house. Code written in Microchip C18. The code walks through dc501 at varying intensities, then dc19, and finally a handle. 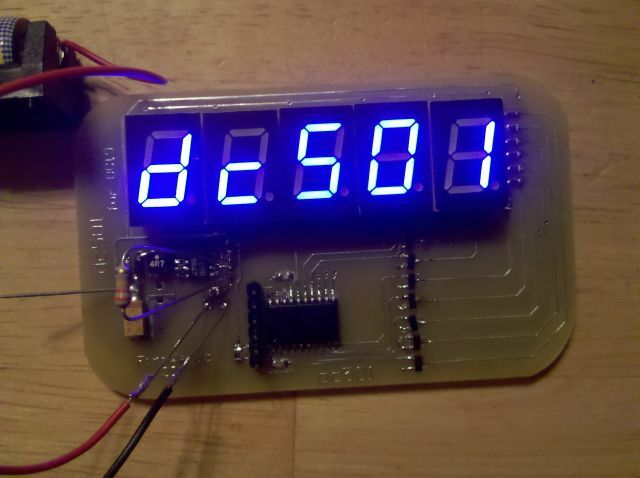 I customized each dc501 member’s badge with their handle, or at least best I could with the 7-segment displays. Snide was easy, Quin not bad, ShortGrrl’s became “6rrl” and mine was “Fir” with dancing dashes. I wrote the state machine to be easily modified if members wanted to change the sequence, add displays, and so forth. Buying boards in a panel lot can reduce cost for home projects, but you have to cut them. I cut boards with a dremel and cutting wheels, and shape the boards on a belt sander. Wear some kind of mask so you don’t breathe the dust, it’s fiberglass and does the same thing to your lungs as asbestos. I am planning on making dc501 badges for Defcon 20; the thought now is to go tiny and see if I can fit the same basic concept in an Altoids mini tin. I’ve got some really cute little 7-seg LEDs from another project. 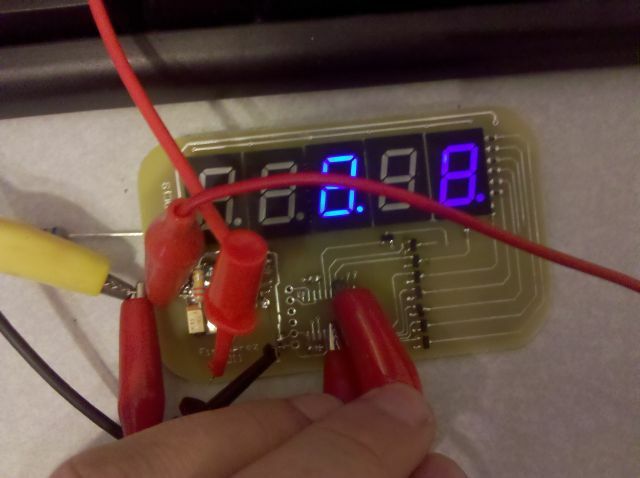 This pic shows the first tests I did on the drive FETs for the LEDs. I really like the dark blue glow of the display on the right. And the first test with running code.